By Sadiq Umar – The wife of the President, Aisha Buhari has denied ordering the arrest and detention of her Aide De Camp, Sani Baban-Inna, even as she alleged Mr. Baban-Inna was arrested for defrauding unsuspecting associates and officials of government. The Nigerian first lady spoke in a statement by Director of Information to Wife of the President, Suleiman Haruna, Tuesday in Abuja. According to the statement, “CSP Sani Baban-Inna has been her ADC since 2016 and has been associated with her ever since. To the utter dismay of Her Excellency, he has used the opportunity to defraud unsuspecting associates and officials as initial investigations have shown. “The Nigeria Police Force, his employers arrested him to investigate the allegations leveled against him, this, being within their jurisdiction. “She (Mrs. Buhari) therefore wishes to use this opportunity to inform the general public that she has never sent any of her staff to collect any favours on her behalf or on behalf of her children and will never do so. She is therefore imploring anyone that has been defrauded by Mr. Baban-Inna to get across to him to retrieve whatever he took from them. 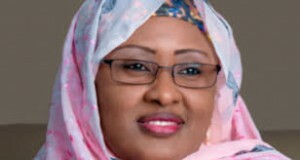 Mrs. Buhari wishes to reiterate that she will not condone fraudulent behavior by any of her staff.